Get ready to sing at the top of your lungs and drop it like it’s hot on the dance floor. Music is our thing and we know how important it is for your event. Sure, your friend that goes to all the music festivals is “good with music,” but important events call for a killer DJ. Our preparation is unrivaled, starting with our initial consultation. If you’re a big Justin Bieber fan, this is the time to let us know. (Don’t worry, we don’t judge). With offices in Raleigh, Charlotte, Richmond, Charleston SC, and San Diego, CA, our DJs are available throughout the southeast for your wedding, school dance, private event, or corporate event. It’s your big day! Our DJs know how to work a wedding. They’ll even have the wallflowers on the dance floor. Corporate events don’t have to be a bore. You may love “The Office”, but your company’s event doesn’t have to be like Dunder Mifflin’s. Don’t just dress to impress, blow your guests away. Whether it’s a small birthday party or a fashion show, we cater to you. know music new and old, so we can craft the perfect mix for your next function using all radio edits. Music and lighting are two of the most important factors in setting the mood. Every detail counts. We got you! Photo Booths are a fun and exciting way to add more flavor to your wedding or event! Check out our blog for fun details on the weddings we DJ! 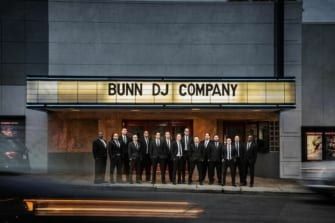 From start to finish our experience with David Fox and Bunn DJ Company was top notch. He put both my husband and I at ease from the very first meeting. He was very organized and their client portal made selecting our songs super easy. All of our guests had a great time dancing the night away (even on a Thursday!) thanks to David. They have a great reputation in the business and I would recommend them over and over again!! Mark McNally was excellent at our wedding! We liked him right away from our first meeting with Bunn DJ. He is extremely professional and took the time we needed to go through song lists for the ceremony and reception without ever making us feel rushed. He tracked each of us down the day of the wedding before the ceremony to ask about any last minute details to make sure he had what we wanted. We also chose to have uplighting and a monogram displayed, both of which looked awesome! During planning, Mark gave his advice where we needed it to make sure the evening ran smoothly, and it is clear that he has done this many times and knows exactly what he is doing. He made sure beforehand that he knew how to pronounce all of the family and bridal party first and last names. (Also everyone loved his Irish accent). He flows from one song to the next flawlessly and had the entire dance floor filled the entire evening! We got many compliments on Mark McNally and had several guests ask us how they could hire him for their next event. Randy from Bunn DJ was AMAZING! Prior to the wedding he was always extremely prompt and helpful in answering my questions. We loved the online portal which made it so easy to plan our event and organize all of the information. Our day went off without a hitch! It was the best day of our lives and we got so many compliments on how fun it was, EVERYONE was dancing thanks to Randy! We have had Mark McNally for 3 years now and he is the best! Always on time with setup and arrives at event time to start playing his great music! He responds to the crowd requests and always makes the evening memorable! Thank you!!!! We used DJ Bunn company for a school event and he was absolutely amazing! He played songs that were common and popular among teens as well as some slower songs and old classics. Everyone genuinely enjoyed his service and we definitely plan on using this company again! DJ Juan was awesome. I loved working with this company. They allowed you to pick out all your music online in their portal which made it so so easy. Juan did a great job with our New Years Eve countdown, all the annoucements, and just making sure the timeline went accordingly. These guys are so organized and professional and do not price gouge at all! My company is in the hospitality/restaurant industry. We had a 1998-themed anniversary party for our company’s 20th. I have never been so impressed by a DJ before. Mark was professional (communicative, clear, friendly, looked sharp!) and was a top-notch DJ. Seriously so much fun. For our event, he kept a group of people with a wide range of ages on the floor for the entire party, and flowed through genres of music seamlessly. People were commenting all night about how good the music was. Really, we couldn’t have been happier. Working with Joe and his team to book our DJ was a breeze as well with their easy online system. We chose to rent their LED light system too, which was totally worth the additional cost. Made the party really come to life. Can’t recommend Joe Bunn DJ Company highly enough! Brandon did an AMAZING job with our wedding. He was super easy to talk to and gave great advice on song choices. On the day he made sure that our goal of having the dance floor full for the whole reception a reality. He knew how to get even the most shy dancers on the dance floor. I can’t thank Brandon enough for the work he did! Highly recommend!